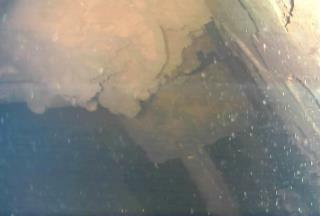 (Newser) – An underwater robot captured images of lava-like lumps Thursday inside a damaged reactor at Japan's crippled Fukushima nuclear plant, spotting for the first time what is believed to be nuclear fuel that melted six years ago. Locating the fuel in each of the three wrecked reactors is crucial for decommissioning the plant. Plant operator Tokyo Electric Power Co. says the robot found large amounts of lava-like debris, apparently melted fuel that flowed out of the core into the primary containment vessel of the Unit 3 reactor at Fukushima. Experts have said the melted fuel is most likely to have landed inside the pedestal after breaching the core. It's believed to be covered by highly radioactive water as deep as 20 feet, reports the AP. That reminds me, I left a meat loaf in the oven last night. In other news, 3 Fukushima reactors are still melting down. Fuel rods have been removed from the 4th.